Pope Francis urged princes, presidents, sheiks and thousands of ordinary people gathered for his installation Mass on Tuesday to protect the environment, the weakest and the poorest, mapping out a clear focus of his priorities as leader of the world’s 1.2 billion Catholics. 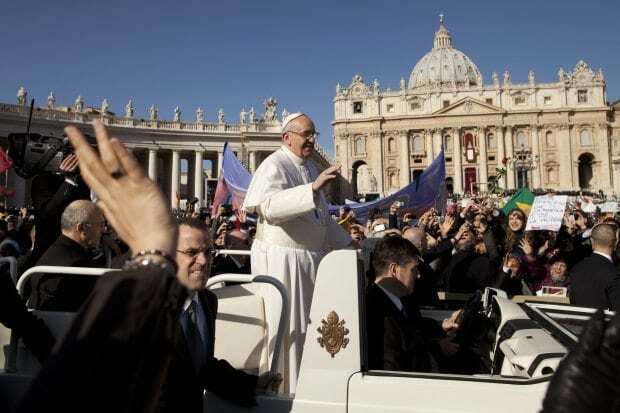 The Vatican said between 150,000-200,000 people attended the Mass, held under bright blue skies after days of chilly rain and featuring flag-waving fans from around the world. “Shalom!” read one banner, Hebrew for “Peace.” “Viva il Papa” read another, “Long live the pope.” In Buenos Aires, thousands of people packed the central Plaza di Mayo square to watch the celebration on giant TV screens. This entry was posted on March 19th 2013 at 6:21pm/18:21 and is filed under Live News Column 1, World News. You can follow any responses to this entry through the RSS 2.0 feed.